Kyle Bennett scored twice as Portsmouth thrashed Notts County in Mark Cooper's first game in charge of the Magpies. Notts, who have now lost seven of their last eight matches and are only 12 points off the League Two relegation zone, looked comfortable until Bennett shot home just before the break. Bennett made it 2-0 when he slotted in just after the restart. A Christian Burgess header and Marc McNulty's lob sealed a win which keeps Pompey five points off the top three. Match ends, Portsmouth 4, Notts County 0. Second Half ends, Portsmouth 4, Notts County 0. Attempt missed. Kyle Bennett (Portsmouth) right footed shot from outside the box is too high. Goal! Portsmouth 4, Notts County 0. Marc McNulty (Portsmouth) header from the centre of the box to the top right corner. Assisted by Ben Davies with a cross. Izale McLeod (Notts County) is shown the yellow card for a bad foul. Kyle Bennett (Portsmouth) wins a free kick in the defensive half. Foul by Izale McLeod (Notts County). Corner, Portsmouth. Conceded by Robert Milsom. Substitution, Portsmouth. Conor Chaplin replaces Michael Smith. Attempt saved. Gary Roberts (Portsmouth) left footed shot from outside the box is saved in the top centre of the goal. Goal! 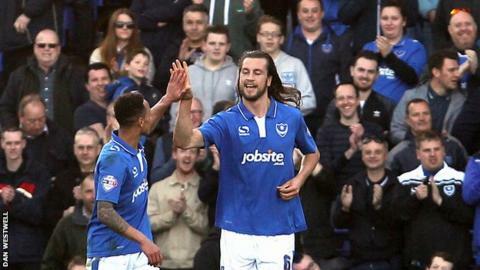 Portsmouth 3, Notts County 0. Christian Burgess (Portsmouth) header from very close range to the bottom right corner. Assisted by Kyle Bennett. Attempt missed. Kyle Bennett (Portsmouth) right footed shot from outside the box misses to the right. Substitution, Notts County. Adam Campbell replaces Alan Smith. Alan Smith (Notts County) is shown the yellow card for a bad foul. Michael Smith (Portsmouth) wins a free kick in the attacking half. Liam Noble (Notts County) wins a free kick in the attacking half. Foul by Enda Stevens (Portsmouth). Jon Stead (Notts County) wins a free kick in the attacking half. Wesley Atkinson (Notts County) wins a free kick on the left wing. Substitution, Portsmouth. Kal Naismith replaces Adam McGurk. Attempt blocked. Michael Smith (Portsmouth) right footed shot from the centre of the box is blocked. Corner, Notts County. Conceded by Enda Stevens. Substitution, Notts County. Wesley Atkinson replaces Andrew Boyce. Substitution, Notts County. Graham Burke replaces Stanley Aborah. Foul by Michael Smith (Portsmouth). Andrew Boyce (Notts County) wins a free kick in the attacking half.